As published by Great Lakes By Design (Volume 2, Issue 40). HGA is a Minneapolis-based multidisciplinary design firm rooted in architecture and engineering. Since its establishment in 1953, the firm has developed a portfolio of diverse projects reflecting the belief of enduring and influential design is the result of an intentional insight into the people and passion fueling each unique environment. Throughout the years, HGA has provided a range of design services such as architectural, engineering, interior, landscaping, lighting, sustainability, and planning to a variety of markets, such as arts and culture, government, healthcare, education, corporate, and civic from its eight office locations. The firm is also known for having a deep tradition of partnering with higher academic institutions, particularly in the performance arts. “It is part of the DNA of our company’s roots,” Blanski said. 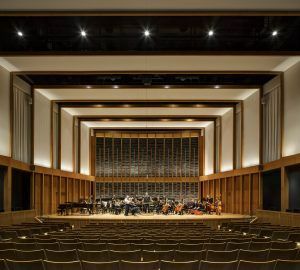 Due to this history in the higher educational sector throughout the Midwest—and beyond—HGA was brought on board to provide design services for the 64,000-square foot Jack H. Miller Center for Musical Arts at Hope College in Holland, Michigan. The new music facility—defined by its sweeping, light-filled glass lobby and distinctive brick and limestone exterior—not only replaced the deteriorating 1956-built Nykerk Hall of Music with a world-class facility integrating high-performance, flexible acoustics, but also acts as the connective tissue between community and college along Columbia Avenue between 9th and 10th Streets in downtown Holland. 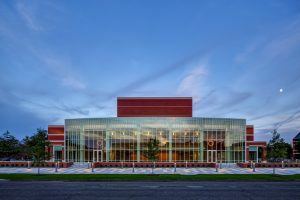 Rather than construct the music venue at the center of campus where the former Nykerk Hall of Music was located, Hope College chose a site at the edge of its property to create a welcoming arts destination. The move was meant to further strengthen its relationship to the community while serving as the host of a developing, thriving arts scene. Rebecca Celis, AIA, LEED AP, Principal and Project Manager at HGA, said it was a natural fit to move the site location closer to the edge of campus as more of a gateway connection given the college’s goal to strengthen the connection between the community and their programming. “They were very clear from the beginning that they wanted a concert hall that could serve up to 800 people, which would be quite large given the size of their student body,” Celis said. “They felt in their desire to be an arts institution attracting top audience, top talent, and touring shows, they wanted to make sure they had enough capacity to fit a larger audience. They also wanted it to be acoustically flexible to accommodate the variety of different types of music that could happen in the hall,” Celis added. The Jack H. Miller Center for Musical Arts, so named in honor Hope College graduate Jack H. Miller of the Zeeland-based Howard Miller Company for his lifetime of generosity to the college, features two performance venues, classrooms, practice rooms, faculty, studios, and office spaces for the academic institution’s Department of Music. From the 800-seat concert hall with a 550-seat main floor and a 250-seat balcony, the 125-seat John and Dede Howard Recital Hall complete with a Steinway & Sons concert grand piano, and the dedicated rehearsal space serving choral and instrumental ensembles; to the 17 individual practice rooms, updated piano and computer labs, percussion and recording studios, and 24 faculty teaching studios and offices, each space was designed for flexibility and sound in mind. Celis noted the new hall alone had to not only accommodate a new organ that was donated as part of the project, but also serve jazz, choral, and other types of music that could be performing in the space. “Our drivers were: how do we make this building work for all those different types of musical programming in the space and still perform really excellently?” Celis said. Faculty offices double as studios where students have one-on-one lessons with professors; the recital hall integrates technology that can leverage additional lighting and flexibility in seating arrangements for a variety of room layouts; and the 800-seat concert hall was designed specifically with multifunctional acoustics in mind. Blanski, who noted acoustics is a science and field unto itself, said the new concert hall is what is known as tune-able. “The tuning of the room changes by drapes that are drawn across the room at different heights and different lengths to either dampen or heighten the room’s acoustic vibrancy or heighten the room’s acoustic vibrancy,” Blanski said. “For example, when an all-electronic performing group would come in, it’s going to be a high-volume, heavy-bass, electrically-driven music performance. Typically you would pull the drapes so you can see them. If it’s a small quartet or solo on the stage where you want the room more vibrant, you pull all the curtains back into their pockets, the doors close, and the room has a stronger reflective power to it,” Blanski added. Celis also noted some of the acoustic flexibility was integrated into the architectural elements in the space. In the concert hall, the rear wall behind the performance platform comprises movable panels that can be brought forward to create a more intimate backdrop for smaller ensembles. The panels can also be re-organized and can help direct sound toward the audience through activating large panels that flip up over the top of them. “It helps not only visually and aesthetically to reduce the size of the platform upon which the performers are seated or standing, but also it gives them an acoustic backdrop to help hear themselves and one another better,” Celis said. The Jack H. Miller Center for Musical Arts project also presented an exterior acoustical challenge as the team worked to mitigate noise and vibration generated by the active rail line located adjacent to the site. HGA proposed creating a series of isolated concrete boxes within the building infrastructure, and surrounding the concert hall with lower program volumes, while leveraging an exterior masonry combined with concrete panels to frame and further insulate the interior spaces. “One of the challenges to our team was to make sure the environments we were providing—particularly in the performance of the concert hall, but also in the rehearsal spaces—weren’t negatively impacted by the sound of the train coming by,” Celis said. More than 54,800 square-feet of pre-cast concrete structural wall panels were used in the construction of the facility and sourced locally from Kerkstra Precast Inc in West Michigan. The joint venture team of Owen-Ames-Kimball Company and GDK Construction served as the construction manager for the project. Combined with the chilled-beam mechanical system selected for the project based on its acoustical performance and energy efficiency, a unique glazing coating on the south-facing exterior wall to reduce solar heat gain, the nearly 88 percent of construction waste that was recycled or diverted from landfill, and the more than 40 percent reduction in annual water use of user-fixtures, the Jack H. Miller Center for Musical Arts was certified as LEED Silver by the U.S. Green Building Council. Blanski said one of the most important ways to achieve a high-performing piece of architecture striving for state-of-the-art excellence in both energy reduction and acoustics is to manage heating and cooling. Rich woodwork is visible from the front plaza, as a wood-framed staircase and detailed railing ascends and stretches across the width of the lobby, anchored on either side by wood paneling. The wood sets the stage in the 800-seat concert hall and it can also be found wrapping through rehearsal spaces, corridors, and classrooms. Custom clocks designed and provided by the Miller family, and pre-cast music-inspired medallions saved from the former Nykerk Hall of Music also celebrate the history of industry and craft inherent to the region—which was an intentional part of HGA’s approach and design process to ultimately deliver a project that paid homage to the unique characteristics of a given community. 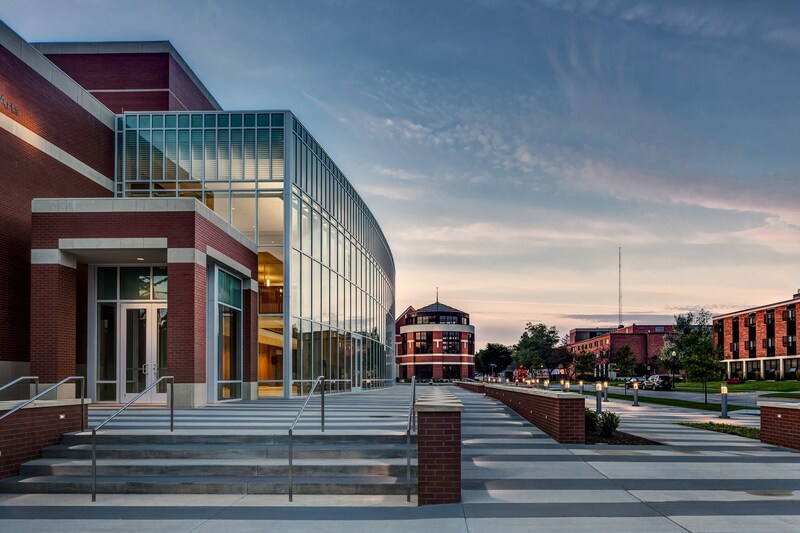 Completed in 2015, the Jack H. Miller Center for Musical Arts’ brick and limestone façade, tempered by glass offers a striking yet refined profile in the heart of the downtown landscape. It bridges a legacy of music education and performance with continued and new opportunities; it renews and supports a relationship with the community; and it acts as a gateway to not only the Hope College campus, but also the city of Holland to Lake Michigan.